We are main husqvarna dealers and have been for over 20 years. We have recently become dealers for Hyundai Power Equipment and offer a range of products. We stock a wide range of Farming and Garden Equipment. 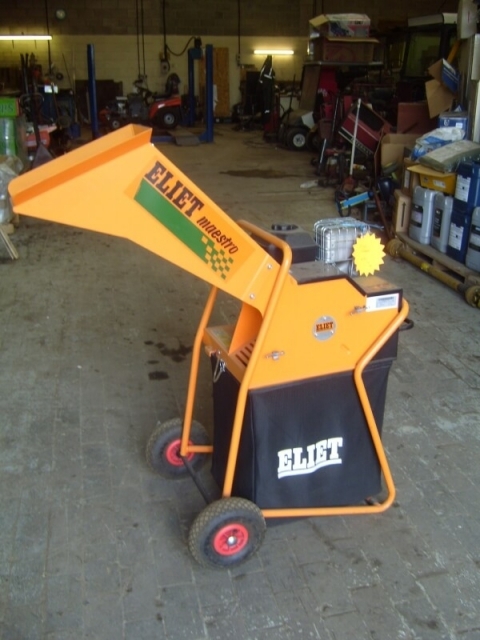 This high-specification petrol shredder from Eliet is superbly well-equipped, and as such will prove a fast, efficient and environmentally-sound way to dispose of waste from both kitchen and garden. Key to its exceptional shredding-performance is its employment of Eliet’s unique Chopping Principle, whereby a set of 12 ultra-sharp knives operating at a rapid 36,000 strokes-per-minute reduce material to an ultra-fine mulch that will rot-down at speed. Branches up to 40mm in diameter are acceptable; and shredded-waste is deposited in a capacious 125-litre collection for easy delivery to the compost-heap. Driving the Eliet Maestro Petrol Shredder is a high-powered Briggs & Stratton Intek Industrial/Commercial engine, which utilises the latest overhead-valve technology so as to significantly reduce fuel-costs; noise; and exhaust emissions. Extra-large 25cm wheels with pneumatic tyres allow for easy site-to-site movement and provide rock-solid stability during operation; while the unit’s all-steel construction and epoxy-paint finish combine to ensure an impressively lengthy service-life. Another key benefit of the Eliet Maestro is its large-shredding surface that works to ensure you’ll be able to process huge amounts of waste in quick-time.